What Is A Turkey Fryer? Everyone loves fried chicken, right? Well, this festive season – and any other time of year, really – why not treat yourself, and your friends and family, to fried turkey? After all, everyone offers roast turkey – and they do say it pays to be different! Fried in peanut oil (which has a higher flash point than other oils, making it a safer option; peanut oil also has a higher smoke point, meaning it imparts more flavor to the meat than cheaper oils, and, best of all for the health-conscious among us, it is cholesterol free), deep-fried turkey produces a moist, juicy, flavorsome bird, with a crisp outer skin. When frying turkey, you will need to remove it from the heat at a lower core temperature than if you were roasting, as the carry-over cooking (the length of time meat will continue to cook, from the inside out, once you have removed it from the heat) is longer than when roasting. You can end up with a dry, unappetizing bird if the core temperature is too high when the turkey is removed from the heat. 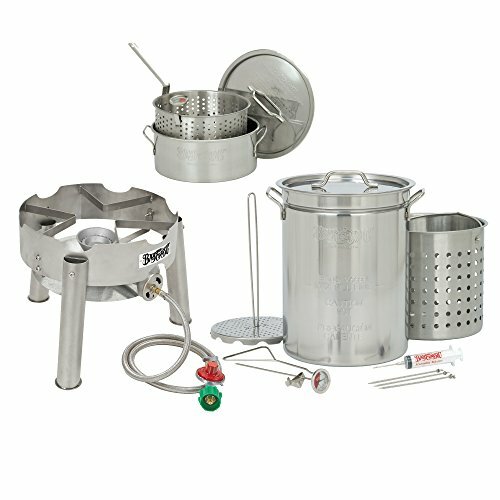 Because of the safety issues involved in handling hot oil, it is necessary to use a proper, purpose-built turkey fryer, rather than trying to economize. If you regularly have large get-togethers of family and friends, a turkey fryer, whether in your kitchen or out on the deck (if the weather is suitable), is definitely a worthwhile investment. Most models will readily handle seafood, fries, and vegetables, as well as chicken, wings, and other meat joints, such as pork loin or brisket, making them a party favorite, or the perfect addition to a romantic, home-cooked, candle-lit dinner! It is important to note, however, that many smaller fryers do NOT cope well with frozen food, owing to their inability to compensate for the temperature differential of frozen food hitting hot oil. Therefore, you will need to be willing to work with fresh meat and vegetables in your fryer. 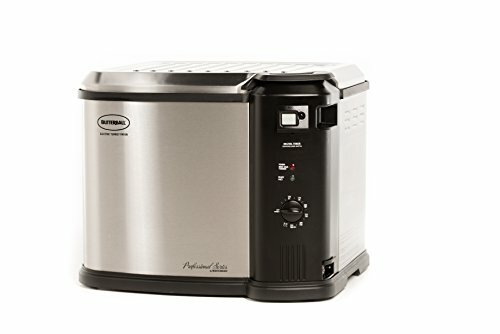 With its built-in digital timer, variable temperature control, a handy, built-in drain valve to remove the oil after cooking, and a removable, porcelain-coated inner pot, designed for easy cleaning, the Butterball XXL Indoor Turkey Fryer is designed to make your cooking experience as smooth, simple, and enjoyable as possible, even when frying a large bird – the ideal size for this fryer is 14-18lbs, but it can handle anything up to 22lbs, and a 16lb bird should be done to perfection in just over an hour – a definite improvement on roasting times! This fryer not only comes built for simplicity and intuitive use, down to the handy fill line indicator, so you know exactly how much oil to use, but it also includes just about every accessory you'll need to get started – including a DVD with no fewer than 44 different recipes for you to try out – because who said turkey was just for Thanksgiving?! Also, as it's an indoor fryer, it doesn't matter how frightful the weather outside is – you can cook, and enjoy, tasty fried turkey in the warmth and comfort of your kitchen. 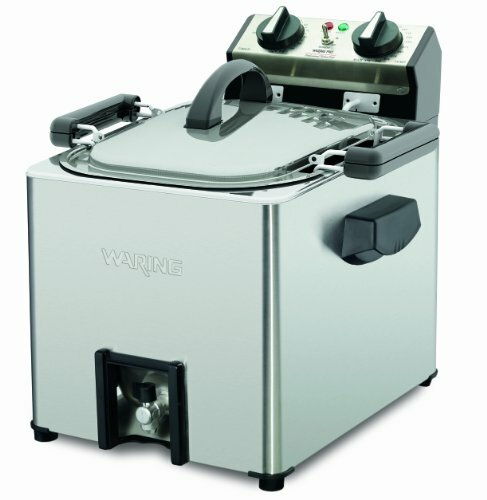 The Butterball XXL uses a third less oil than other fryers, making it a more economical choice, especially considering that peanut oil, being of a higher quality, can often end up being more expensive than other oils: getting a fryer that produces great results on a smaller quantity of oil is definitely the smart choice. It also comes in a range of colors, so you can perfectly co-ordinate with almost any kitchen style or décor. The only downside we can see the the Butterball XXL is that you won't have any excuse to hide away in the kitchen during family meals – but, if you enjoy spending time with your family, that's just another reason to go fried turkey rather than roasted. 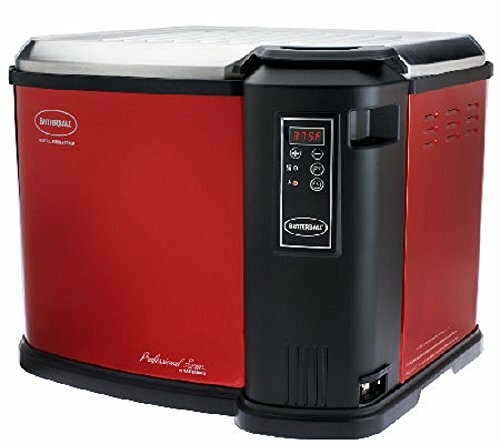 If you don't need to cook such a large bird, there's also the slightly smaller Butterball XL, which still has all the features and functionality of the XXL, but is ideal if you're usually cooking mid-sized (up to 18lbs) birds, or frying fish, wings, and vegetables more often than turkey. If you're an outdoors type who likes to invest in the lifestyle, then the Bayou Classic 1195 is for you. An outdoor, stainless-steel fryer, the Bayou features a raised basket that allows you to steam or boil shellfish or vegetables, as well as frying your turkey or chicken. Ideal for those romantic cook-out meals, or patio parties with friends. This fryer produces a very stable heat, with minimal temperature fluctuations (often cited as an issue for other fryers), and, while it has been noted that it takes a while for the oil to get to temperature, the true outdoorsman (or woman) is rarely in a rush. The construction is strong, solid, and durable – important for anything that will be exposed to the elements – and is easy to clean, thanks to its stainless-steel construction. The Bayou Classic 1195 can hold up to an 18lb turkey, which will comfortably feed 15 people, with plenty of meat per person. Of course, the downside of any outdoor turkey fryer is that you have to use it outside – fine if you have a covered patio, or are used to dealing with the elements, but it might limit the amount of use you get from it, depending on the climate where you live. All in all, though, the Bayou Classic can be considered a good, useful lifestyle investment for those who like their dining, and cooking, al fresco. For the apartment dweller who still needs to be able to fry a good-size turkey, the Chard EDF-15 Electric Turkey Fryer is the ideal kitchen accessory. 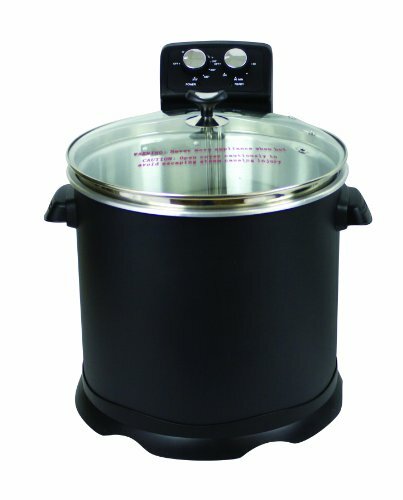 Presented in sleek black, which will blend with and compliment any kitchen décor, the Chard EDF-15 is simple and easy to use, with built in timer and thermostat, and a strainer basket, to easily fry chicken wings or vegetables, and a break-away magnetic cord for additional safety and peace of mind. This fryer can handle a turkey up to 18lbs, whilst being used indoors, and taking up relatively little space. Another fryer for the outdoors type, or just those who live in warmer states, and like to take advantage of balmly evenings, and using infra-red heating, so there's no need for oil (and no hot oil to dispose of after cooking), making it a double win for safety and economy, is the Char-Broil “Big Easy”. This is a propane-fired infra-red outdoor fryer, suitable for turkeys up to 16lbs (which will feed around 10 people comfortably), as well as other joints, fish, and vegetables – it's ideal if you like Cajun-style cooking. The Big Easy comes with a meat thermometer, so you know when your meat is ready to take out, and a handy quick-start guide: it does, however, require a propane tank, which is NOT included, although these are readily available to purchase separately. It also features a built-in drip tray, making it easy to catch the meat juices, for use in rich, flavorsome gravy. Finally, we have another indoor-use fryer, so that those of you in colder climes don't feel it's all about decking and balmy evenings! The Waring Pro TF200B can easily handle a 16lb turkey, and can fry a turkey up to 18lbs. 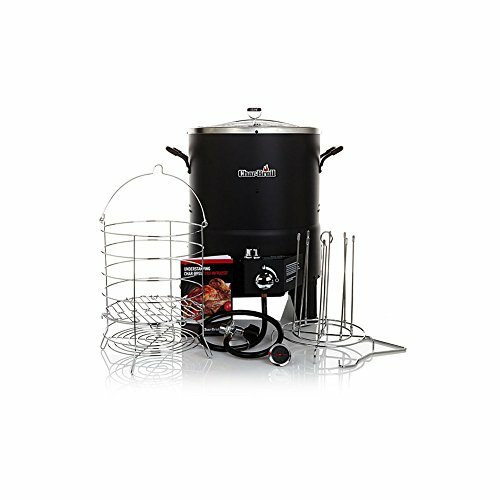 It also comes with a rotisserie basket, which can hold up to 8lbs of food – vegetables, wings, seafood – you name it, the Waring Pro can fry it for you. The rotisserie function also offers highly economical cooking, using a third less oil than traditional fryers. It is easy to clean, and its large surface area makes it ideal for home-made donuts – so it's not just the adults who'll be happy to have the Waring Pro in their home! That said, those with smaller kitchens, or less counter space, may find it a little bulky, as it is a large fryer. It has also been noted that it can suffer from temperature fluctuations, which can result in undercooked meat, especially with turkey. If you regularly enjoy large get-togethers of family and friends, or you live somewhere where cook-outs are an enjoyable option, a turkey fryer is an great, easy-to-use accessory, and not just at thanksgiving! The use of cholesterol-free peanut oil as a frying medium means that you can enjoy healthy fried food, and, being large enough to handle a turkey, a turkey fryer is ideal for cooking pretty much any form of fresh meat, seafood, shellfish, or vegetables – so every day can be fry-day!